Boost your customer support with Freshdesk & Usersnap! Power up your customer support with Freshdesk & Usersnap! 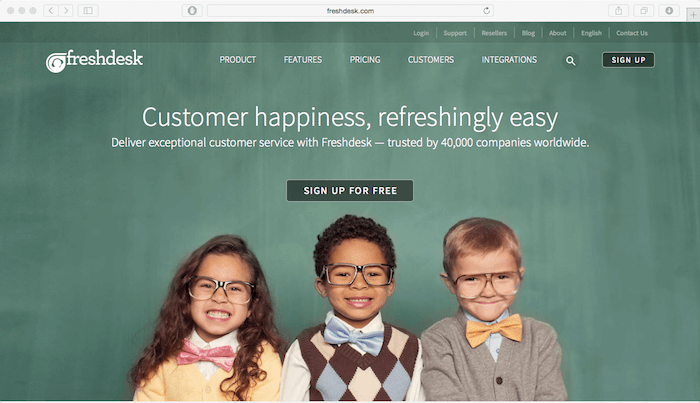 Freshdesk is a simple and easy-to-use customer support software used by some well-known companies such as Sony, Cisco and many others. More and more customers are approaching us on how to get more out Usersnap by integrating it with Freshdesk. 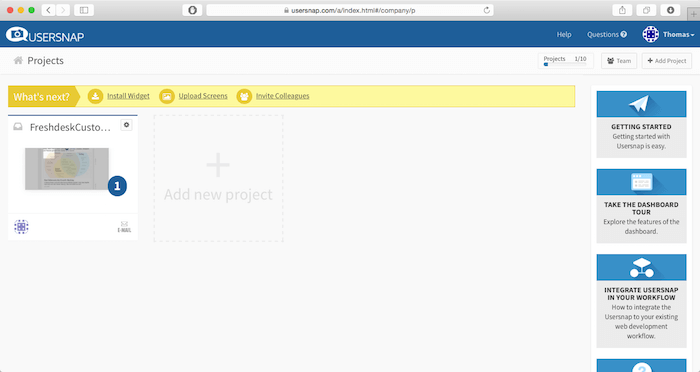 So, I’d like to show you how to boost your customer support by integrating Freshdesk with Usersnap. As mentioned in one of our previous blog posts, customer support is no longer a nice-to-have. Customer support has been – and unfortunately still is – an area where a lot of companies do not put much emphasis on. Yet, customer support is something which makes you unique and outstanding compared to your competitors. A great setup is essential and the right tools will boost your business. For further info on how to set up your customer support, I’d recommend to give the following article a read. So first things first. If you already have a Freshdesk account, you’re good to go and skip this step. Otherwise you have to set up your free Freshdesk account first for getting started with customer support. If you sign up for Freshdesk, you’ll also get a new Freshdesk email, which I’d recommend you to store and save. You will need that email address later on. After setting up your Freshdesk account, you’re ready for the next step. You might wonder why to connect Freshdesk with other 3rd party tools? Freshdesk by its own gives you a great tool set for your customer support. By integrating it with other tools it empowers you to do even more and let’s you be more productive in your customer support team. When integrating Freshdesk with Usersnap you make customer support way easier. 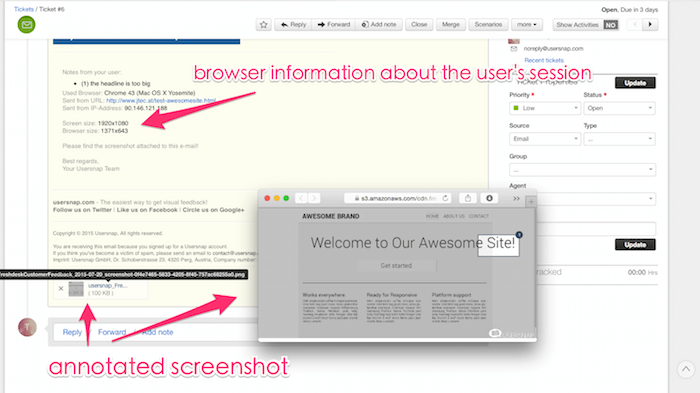 Your customers create screenshots or bug reports (for example on their website). These screenshots are then automatically sent to your Freshdesk account. You customer support team will not only get extra information about the user’s session – such as browser version or installed plugins, but also screenshots displaying the problem of your customers. Now it’s time to sign up for Usersnap (or login if you already have an account). After signing up, you can create a new project – for example – customer feedback. How to connect Usersnap with Freshdesk? It’s time for connecting Freshdesk with Usersnap.With the integrations from Usersnap you can forward screenshots and bug reports to Freshdesk. 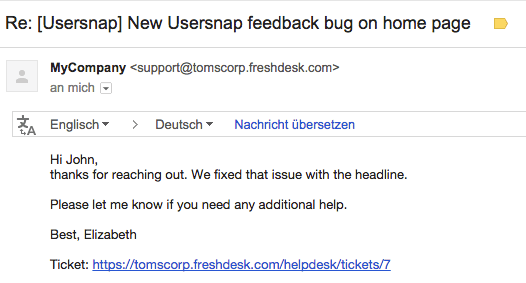 Enter the email address generated by Freshdesk (in my case it’s “support@tomscorp.freshdesk.com”) as the email address which receives the bug reports. only send shortened content without header + footer information to Freshdesk. You can simply activate/deactivate that in the 3rd party settings of Usersnap. decide whether all bug reports should be automatically sent to Freshdesk or if you’d like to choose manually. It’s time for collecting website feedback from customers! 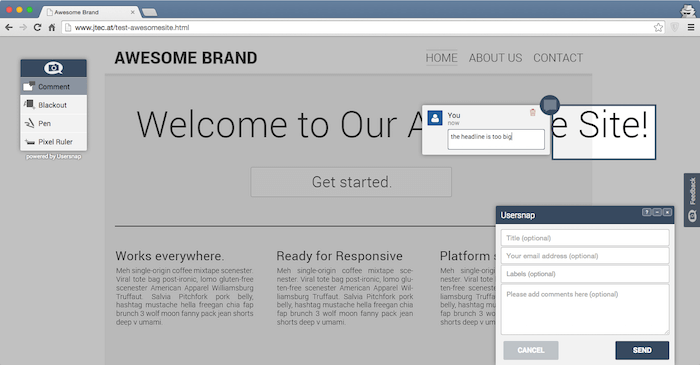 If you want to collect feedback from your website, I’d recommend to embed the Usersnap feedback widget on your website. Otherwise you and your clients can also make use of the available browser extensions. With the embedded Usersnap widget your customers can easily reach out to you by submitting screenshots and customer support requests. After submitting screenshots and customer support requests, all these tickets will be automatically sent to your freshdesk dashboard. Every single piece of information – such as the annotated browser screenshot, used browser, installed plugins are now stored in your Freshdesk dashboard. And the best part? There’s no need for your customer support team to leave Freshdesk ever again. You’re entire customer communication takes place inside Freshdesk. If your customers enter their email addresses (pro tip: enable it as a mandatory field) when submitting a screenshot you can direclty reply to your customer from within Freshdesk. Simply reply to your customer support tickets inside Freshdesk and you’re customers will receive updates and answers directly to their inboxes with the additional information from Usersnap. Getting started with customer support by making use of Freshdesk and Usersnap is easy. It doesn’t require in-depth knowledge or any programming skills. By integrating Freshdesk with Usersnap you can bring customer support on the next level and make your support team way faster. Give the integration a try and see how you can boost customer support. What’s your experience on getting started with Freshdesk? Let me know in the comments! How we implement new product features backed by customer feedback! In our recent post I’ve shown you how we interpret and live up to the “release early, release often” paradigm of software development. In this post I’m going to show you how we handle feature requests and implement new product features. Everything backed by customer feedback.